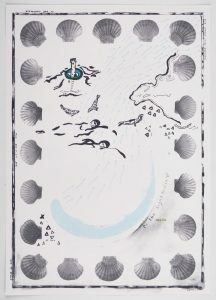 A collection of etchings and paintings that explore folklore, the sea and collections by artist Catherine Haines. Opening Event: Fri 10 Aug 18.00 – 21.00 with Indian street food from Sharmi’s Kitchen, serving curries, chapatis, pakoras, and Indian Scotch eggs. All welcome. With an emphasis on affordable works The Picture Room at Newlyn Art Gallery offers the opportunity to buy paintings, prints and drawings by some of the region’s most recognised artists. All profits from sales directly help to support the gallery’s education and exhibition activities. Work-in-progress of a three-year participative, creative exploration of the life and history of Penzance’s iconic and much-loved lido. This is your chance to incorporate some drawing and painting into your walkies! Armed with paper, paint and dog treats, painter Ben Sanderson will lead you in quick-fire, fun drawing and painting exercises to help you create off-the-cuff sketches of your dog. This workshop is for well-behaved dogs and their owners. Please bring a dog lead. The return of our popular Ikebana workshop. Katsushi Koike, from Japan, will guide you through the art of Japanese flower arranging. £20 including all materials and flowers. Booking essential, please call 01736 223125 to book. Led by the wonderful Alice Ellis-Bray and inspired by our Rose Wylie exhibition, these workshops are for 7 – 13 Year olds. Please wear old clothes as it will get messy! What are your dream adventures? What stories do you come up with in your sleep? – Inspired by the exhibition, you will be painting the story of a dream you have had – onto a pillow case. Sweet dreams! Who is that in the mirror? How do you paint yourself? – Using mirrors, you will be working out how to look and paint at the same time. Looking at story-telling through painting, you will create different scenes of the same story. What goes inside your story box is up to you – possibilities are endless! What’s your favourite colour? How do you know? – Using your instincts, this workshop is all about following your intuition when making colour choices, and painting without getting caught up in too much decision making. What comes naturally when using paint and how do you choose colour? Exploring ideas about our past, our present and our future, you will be creating a triptych of paintings to tell stories through time. When, now and then!